My first real foray into BBQ was a botched affair. I'm not talking about grilling, now: that's direct heat, that's quick and easy (which is not to say bad). But BBQ — cooking with smoke via indirect heat — is on another plane of existence altogether in my book. So I'm visiting my parents in Portland and am all jazzed about resurrecting their smoker. I was all ready with my hunk of pork: a shoulder piece decidedly unpullable in it's uncooked state, but nicely seasoned and carefully brined over night. 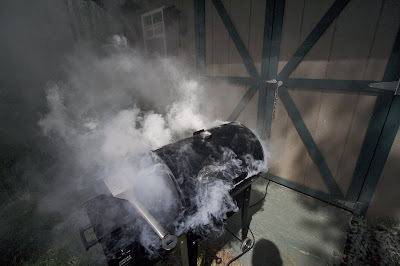 I got up early, as you figure about two hours per pound of meat (and I had about six pounds), and realized that their smoker was non-functional. The element had burned out or some such. Retrofit opportunity: I remembered Alton Brown's episode on BBQ where he used two big flower pots and a portable plugin burner (sweet!). Since it took about three store to find one, I'm not seeing white wisps of smoke until 9 AM or so. As these things take time, it's likely to be a late dinner. . . . So it goes. The thermometer reads 165 at about 8PM and I say, "hey, it's passed the 'acceptable temp' for pork — let's pull it". Well, first it's gotta rest. Half an hour later, it's ready for pulling. Except it doesn't pull — at all. Mom puts it into the oven. People are eating Cheerios by now, I'm sure (my memory gets fuzzy at this point). In any case, it comes out by about 10PM and no one really feels much in the mood for pulled pork anymore. It wasn't a total disaster — you could tell what it was supposed to be — but it certainly wasn't the lovin' spoonful I was going for. . . . Step 1: make friends with your butcher. Well, this is in progress. But we got friendly enough for him to fork over a nice, local hunk of hog. 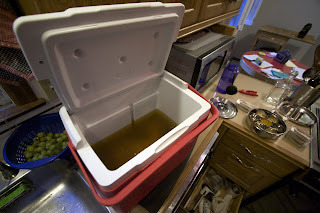 Step 2: brine said hunk in a solution of ice/water (about two gallons, .5 cups salt, .5 cups molasses, 1 Tbpn black peppercorns) for 12 to 24 hours. Step 3: prepare dry rub. I have a second coffee grinder ($12!) dedicated to spices. So toast up in a dry pan over medium heat some corriander seed, cumin seed, and mustard seed (about a handful each) and grind away with some dried chilies. That gave me a bit over a half cup of incredible smelling hot spice which I mixed together with about a half cup of good paprika, a few tablespoons each of garlic powder and onion powder, and about a cup of brown sugar. NO SALT: the pork is already seasoned enough from the brine. Spicing and seasoning are different processes, I say: best keep them separate. timing on this starts to emerge. If you want to be eating pulled pork on Saturday, you should put your pork shoulder in the brine on Thursday night, apply the spice rub on Friday night, go to bed early and get up at the crack of dawn on Saturday to start the smoker. Step 4: Since I've got a 6.5 pound piece of meat, figuring 1.5-2hrs/pound (a figure I've gleaned from the internets), I've got anywhere from 10 to 13 hours to wait. I'm up at 5:30: pecan pellets in the hopper, flip the switch to smoke, toss in the meat, drink my coffee in silent triumph. The internets also told me where I went wrong before: to properly pull pork, it's gotta not just be safe to eat for pork (duh), but it's gotta be rather HOT: like 200 degrees. That's about the average max temp of my smoker when it's going for a while with the lid closed. So we've gotta bring this sizable piece of meat to thermal equilibrium with its smoky surroundings. It's sorta amazing that it can even get there in 13 hours. Not good. This is a lot of smoke (in case you can't tell). I guess what happened is that the firebox got too jammed up with pellets, the electric ignition was covered in ash, but finally lit ALL the pellets that had been feeding into the box without burning. A few minutes of darkness and worrying that the neighbors are going to call the fire department later, there's a huge WHOOOSH and the lid flips up about six inches and the wood goes from smoke to fire. I rescue my pork from the licking flames and turn everything off and let it smoke the neighborhood for a good half hour. Then I spoon out the embers and start again. Time lost: probably three hours of cooking time. Lesson learned: WATCH YOUR BBQ AND DON'T LET YOUR SMOKER STOP SMOKING! We call Big Al's Pizza: pretty decent pizza, as it turns out: the crust is good with honey on it (that's another story: but try it) and it's better the next day. 11PM rolls around and my temp probe is finally reading 195. Good enough. I've also read that one should really let this thing rest for a good two hours. So by 1AM, I'm finally pulling (and trying not to eat all the dark bits). 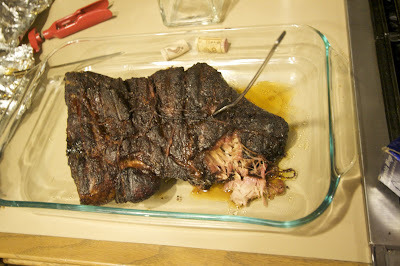 The next day, the fruits of my three days of labor are sweet and smoky indeed. Version 3.0 is where I'll hit my stride, I think. Next adventure: baby back ribs. I've already called my friend Tony the butcher. . . .